A brain imaging study of very premature babies in a neonatal intensive care unit finds there is altered development in preterm infants of a part of the auditory cortex associated with poor language skills in early childhood. The research, published in eNeuro a journal of the Society for Neuroscience, suggests that developmental disturbances to this brain region may underlie speech and language difficulties observed in the premature population. Neural machinery that supports hearing is typically functional by 15 weeks before birth, revealing that babies are sensitive to speech and language while they are still in the womb. Brian Monson and colleagues used a magnetic resonance imaging technique to track changes in Heschl's gyrus, a part of the brain containing both the primary auditory cortex (pAC) and nonprimary auditory cortex (nAC). In 90 infants born prior to 30 weeks gestation, researchers show the pAC matures earlier but more slowly than the nAC, which changes rapidly in the last 10 weeks of a typical pregnancy. In a follow-up assessment at two years of age, developmental differences in the nAC of preterm infants were associated with reduced expressive language as observed in gestures as well as in vocabulary. "This technique measures the diffusion of water in the brain tissues, which can tell you a lot about the development of neurons and axons. As brain structures grow and mature, water diffusion in the gray matter and white matter changes in recognizable patterns, allowing researchers to track how and at what rate tissue is developing." Brian B. Monson PhD, Department of Pediatric Newborn Medicine, Brigham & Women’s Hospital, Harvard Medical School, Boston; USA Department of Radiology, Boston Children’s Hospital, Harvard Medical School, Boston, Massachusetts, USA. Ultrasound studies reveal, for example, that, beginning at least as early as 25 weeks into gestation, fetuses will blink or move in response to externally produced sounds, he said. Other research shows that newborns prefer to listen to sounds - such as music or speech - that they were exposed to in the womb as opposed to unfamiliar sounds. Electroencephalogram studies of brains of preterm infants also show electrical activity in their auditory cortex in response to sound. "From these types of studies, we know that fetuses in the third trimester of gestation are hearing, learning and creating memories. It's pretty remarkable that such an immature system already has the ability to start distinguishing and learning." To better understand how the auditory cortex matures in the last trimester of gestation, Monson and his colleagues turned to a large dataset collected at the St. Louis Children's Hospital Neonatal Intensive Care Unit between 2007 and 2010. The 90 premature infants in that study had undergone magnetic resonance imaging one to four times in the course of their stay in the Neonatal Intensive Care Unit (NICU). Another 15 full-term babies were recruited from the Barnes-Jewish Hospital in St. Louis and scanned within the first four days of their lives. These scans were used as examples of uninterrupted fetal brain development, for comparison with preterm babies. Monson: "I hope one day we also will be able to intervene for those infants who may be at greatest risk of language deficits, perhaps even before they begin to use words." Primary and nonprimary cerebral cortex mature along different timescales, however the differences between the rates of maturation of primary and nonprimary cortex are unclear. Cortical maturation can be measured through changes in tissue microstructure detectable by diffusion magnetic resonance imaging. 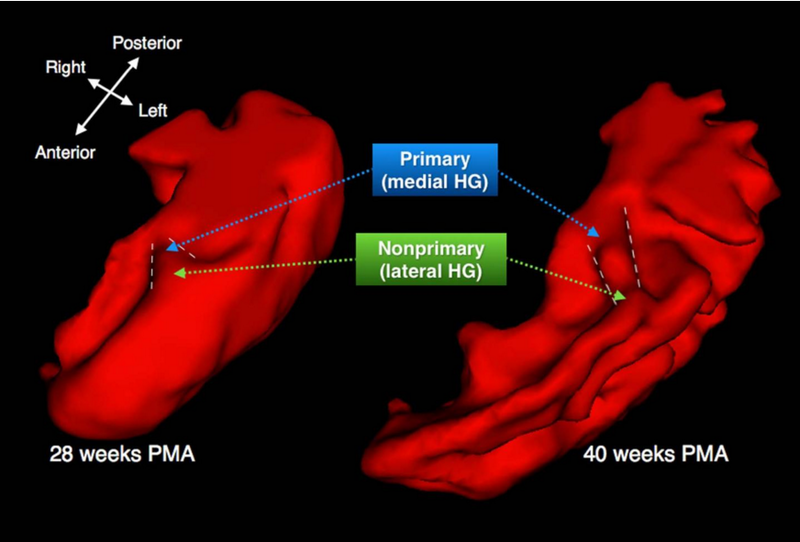 In this study, diffusion tensor imaging was used to characterize the maturation of Heschl’s gyrus, which contains both primary and nonprimary auditory cortex, in 90 preterm infants between 26 and 42 weeks postmenstrual age (PMA). The preterm infants were in different acoustical environments during their hospitalization: 46 in open ward beds, and 44 in single rooms. A control group consisted of 15 term-born infants. Diffusion parameters revealed that (1) changes in cortical microstructure that accompany cortical maturation had largely already occurred in primary auditory cortex by 28 weeks PMA, and (2) rapid changes were taking place in nonprimary cortex between 26 and 42 weeks PMA. At term equivalent PMA, diffusion parameters for auditory cortex were different between preterm infants and term control infants, reflecting either delayed maturation or injury. No effect of room type was observed. For the preterm group, disturbed maturation of nonprimary (but not primary) auditory cortex was associated with poorer language performance at age 2 years. Different brain regions mature at different rates, particularly early in development. Knowledge of when specific sensory brain regions are maturing is critical for understanding the susceptibility to external sensory influences (e.g., during critical periods) and potential for vulnerability to injury. Here we demonstrate in vivo that, during the perinatal period, human primary auditory cortex matures earlier than nonprimary auditory cortex, consistent with accounts of brain development from histology. However, we detect more rapid changes in nonprimary auditory cortex during this period. Our findings indicate that disruption of nonprimary cortex (but not primary cortex) maturation during this developmental period is associated with poorer childhood language development. Differential developmental timelines may render nonprimary sensory cortex more vulnerable. Authors report no conflict of interest. This work was supported by the National Institute of Child Health and Development (grant numbers R01 HD057098 and K12 HD055931-06), National Institute of Neurological Disorders and Stroke (grant number K02 NS089852), National Institute of Mental Health (grant number K23 MH105179) the Intellectual and Developmental Disabilities Research Center at Washington University in St. Louis (grant number P30 HD062171), and the Doris Duke Charitable Foundation (New York, NY). The funders had no role in study design, data collection, and analysis, decision to publish or preparation of the manuscript. eNeuro, the Society for Neuroscience's new open-access journal launched in 2014, publishes rigorous neuroscience research with double-blind peer review that masks the identity of both the authors and reviewers, minimizing the potential for implicit biases. eNeuro is distinguished by a broader scope and balanced perspective achieved by publishing negative results, failure to replicate or replication studies. New research, computational neuroscience, theories and methods are also published. Development of the left hemisphere temporal plane from 28 to 40 weeks post menstrual age (PMA). Heschl's gyrus or HG (bounded by white dashed lines) is forming by 28 weeks PMA and has an adult-like appearance by 40 weeks PMA. Primary and nonprimary auditory cortex are located in medial and lateral Heschl's gyrus (HG), respectively. Image credit: Monson et al., eNeuro (2018).